Town of Prussia. Originally a village, it was incorporated in 1534; and soon afterward the first Jews settled there, with the authorization of Count Andreas Lescynski (1580-1606). Many of these Jewish settlers were probably of German origin, as the names "Auerbach" and "Oldenburg" frequently occur. The first privilege granted to them is dated March 10, 1626. In that year there already existed a synagogue at Lissa, also a cemetery, the plot for which had been presented by Count Lescynski. The earliest extant tombstone is dated 1662. At that date the community was fully organized and the schedule of taxation determined. Communal expenses were defrayed by taxes on slaughtering, dowries, the sale of houses, the ritual bath, and legacies. The Jews of Lissa not only engaged in commerce, but also followed trades: there were tailors, furriers, shoemakers, goldsmiths, lacemakers, locksmiths, tanners, barbers, embroiderers in gold, jewelers, buttonmakers, dyers, and turners. Most of these trades were organized into gilds, each of which generally had its own rabbi. The strong competition between the Jewish artisans and merchants and the Christians often led to sanguinary conflicts. The Jews of Lissa suffered much during the wars in which Poland engaged, and more especially from the Cossack persecutions under Bogdan Chmielnicki. On the partition of Poland Lissa was annexed to Prussia. In its most prosperous days Lissa contained between 4,000 and 5,000 Jews. It became the seat of a famous yeshibah which attracted students even from distant parts of Germany ("Memoiren der Glückel von Hameln," ed. Kaufmann, pp. 231-234). The first rabbi of Lissa was Isaac Eilenburg (1648), whose successors were: Jacob Isaac ben Shalom (d. 1675); Isaac ben Moses Gershon (d. 1695); Ephraim Kalisch; Mordecai ben Ẓebi Hirsch (d. 1753); Hirsch's brother, Abraham b. Ẓebi Hirsch (died as rabbi of Frankfort-on-the-Main, 1768); Phoebus Heilman (rabbi of Bonn; died at Metz); Aryeh ben Samuel; Tebele Horachow (d. 1792); and JacobLissa (died at Stry in 1832). 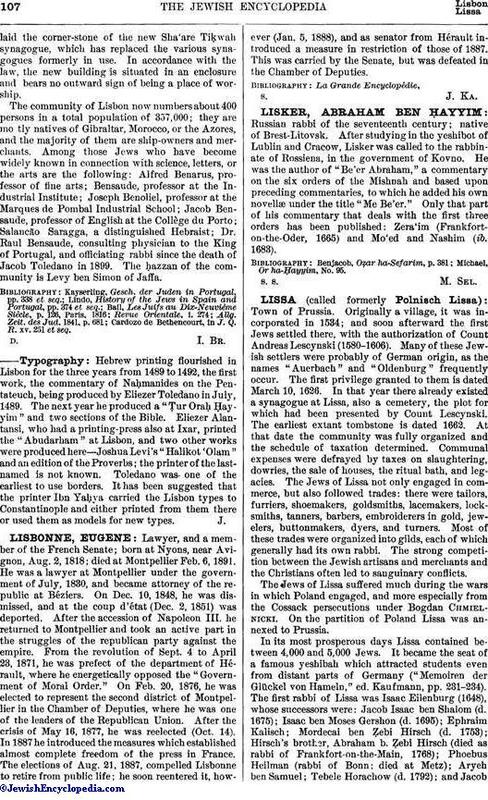 After Jacob Lissa's death the rabbinate remained vacant until 1864, when the present incumbent, Dr. S. Bäck, was elected. 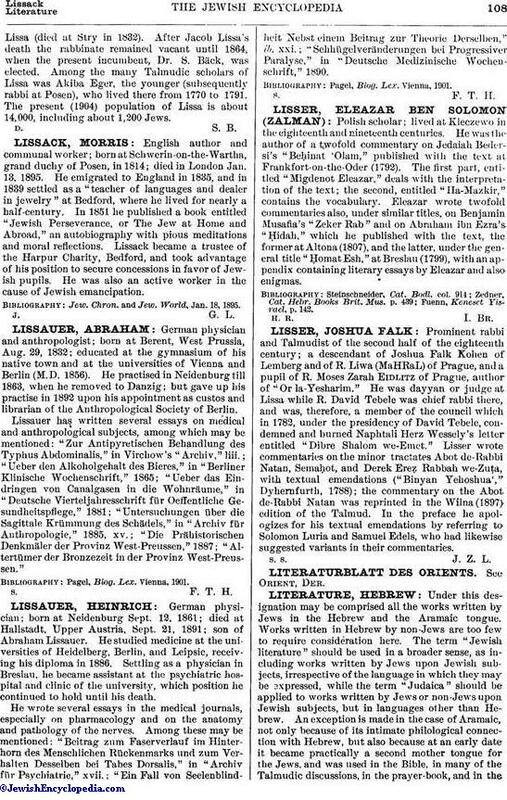 Among the many Talmudic scholars of Lissa was Akiba Eger, the younger (subsequently rabbi at Posen), who lived there from 1770 to 1791. The present (1904) population of Lissa is about 14,000, including about 1,200 Jews.